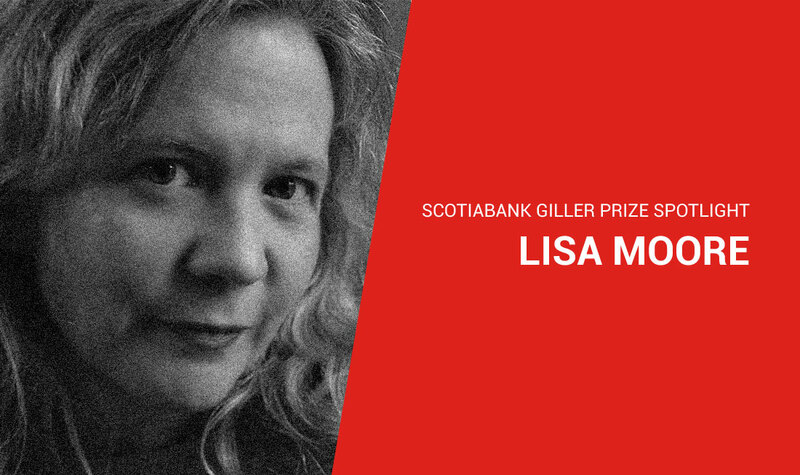 Lisa Moore has been selected for the 2018 Scotiabank Giller Prize for her novel Something for Everyone. I am inspired by the people around me. On the plane back to Newfoundland, yesterday, the man beside was sleeping. His mouth agape, a full-chested snore that had heft and determination. The exhale followed by a bubbly contrail, abruptly cut short by a chuffle, the next, urgent intake of breath. One of the man’s hands was spread on top of his paperback, and the only word of title not covered by his fingers was ‘dream.’ I wrote down everything I could imagine about this man’s life. I was inspired by a description of a snore written by Clarice Lispector in the novel, Chandelier, that had been haunting me for days, an old lady who snored as if a bird were trying to escape her mouth, the wings squashed, trying to unfold, the feathers ruffling, half-way out, half swallowed. Every time I fell asleep for a week after I read that description, I jolted awake and looked around to see if someone had heard me snoring. If someone was next to me with a pen and paper, writing down what it sounded like! “when true knowledge proves irrelevant, one is free to invent.” Javier Marias, a novel called All Souls. And this opening line from Larry Mathews’ hilarious and touching new novel, An Exile’s Perfect Letter: “ I think I may be in love with my dentist.” I also like the sincerity with which the dentist tells him she is happy with his gums. Broad Cove, Newfoundland, in front of the woodstove, when the sun is cracked, all runny like an egg, over the horizon. I paint landscapes. I draw with charcoal. No, but I do put on a new necklace – a stone, a piece of polished glass – when I start a book. I try to keep it on until the book is finished. Makes my neck quite green! Sometimes I cheat, if I’m stuck, switch out the labradorite for amber, hope the necklace/novel gods don’t notice. An Exile’s Perfect Letter by Larry Mathews. I read A Fine Balance before I went to India. Reading that book was transformative. I love Mavis Gallant. The wit, the feminism, the characters dazed by the second world war – refugees, ghosts, German actors playing Nazis in black and white movies, lovers, and forsaken children – all homeless, in some subtle or extraordinary way, all crossing borders, lots of different kinds of borders: moral, geographical, psychological, and metaphysical. The scorching political climate we are living in, raging fires, austerity budgets, multiple orgasms, seeing the Fjord of Eternity in Greenland, and a belief in the power of art, that it can alter us, and even though the chance of coming up with something truly transformative is, at best, a very long shot in the dark, I kind of love trying. I think everybody has a book in them. Might as well get it out. I might better be able to say what I want from a book. I love looking up from a book, because I have to turn off the kettle, or because the bath is about to run over, or because a cat is yowling for attention, and to have to blink and blink because the world – my world – looks like the world of the novel. I see it through the writer’s eyes.